Cyberstud poker game is one of the many variants of poker that is now readily available across the internet, in many online casinos for gamblers to play. Cyberstud poker is one of the many variants of poker that is now readily available across the internet, in many online casinos for gamers to play. Over the last few years, traditional five card draw, and Texas hold 'em poker has seen competition from interactive poker games, and cyberstud poker is just one of those games, that is slowly making a name for itself in the online casinos. Although looking at the game for the first time, the rules and strategies of cyberstud poker may seem complicated, the card game can generally be learned quite quickly, if you have the patience for poker. Cyberstud poker pits the player against the dealer. The player is dealt a total of five cards, as is the dealer, though one of the dealers cards is dealt face up. By looking at his own hand, and comparing it to that of the one visible card the dealer is, the player must make a decision. The player can either decide to increase his original bet, to potentially beat the dealer, or fold, which has the potential to minimise the damage of a loss. Should the player decide to call (raise his bet), the dealer will deal another four cards. If the dealer does not have an Ace to King pair or higher, you will paid double your original ante bet, or the equivalent depending on what you have decided to be with originally. As a general rule, if a player has less than a Ace to King in his hand, he or she is advised to fold, whilst pairs are dealt roughly 42% of the time, and a player is strongly advised to call if receiving such a hand. Should a player find himself with a high card that matches the dealers, it may also be interesting to call, as the dealers chances of obtaining a pair himself are reduced. Cyberstud Poker is not designed to be played against other human players, and is purely a game matching you against the dealer. Big money can be made even if the player doesn't have anything really significant in his own hand, should he choose to call, and beat the dealer. Payouts are generally quite generous, which is a massive advantage over playing with several players in a game, such as Texas hold 'em. Cyberstud poker is often included as a progressive jackpot, making this variant of cyberstud poker even more profitable than the ordinary game. Should you win on the progressive, you will find yourself with a wealth of winnings, some serious money, which is often the result of the progressive game featuring a side bet function, that is absent from traditional cyberstud poker. As mentioned, cyberstud poker has gained in popularity in recent years, as a way of players being able to play a quick poker variant against the dealer, rather than having to sit down for hour after hour with other players in an online poker room. 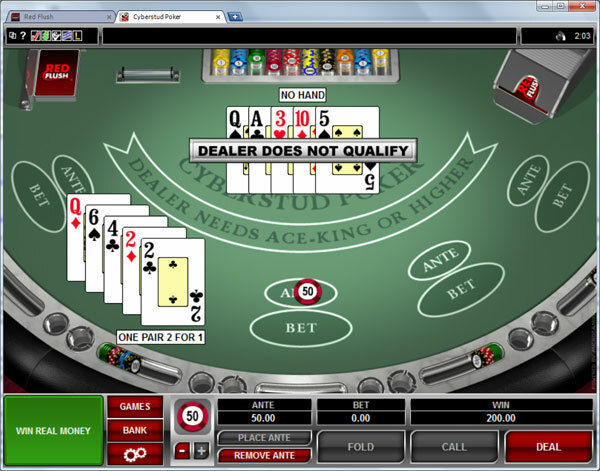 The game is available from most online casinos that offer poker games or progressive jackpots. There are several smaller variations out there, with minor rule changes, so to be sure you have the right game, most online casinos offer a rule book or free play version on the site for you to trial first. This cyberstud poker demo is a great chance to see how the game works, and to make sure you have the right cyberstud poker variant, before you begin to play.